Whether you want to know how to create a playlist on Spotify for mobile, desktop, Android, or iPhone, this updated guide for 2019 has you covered. 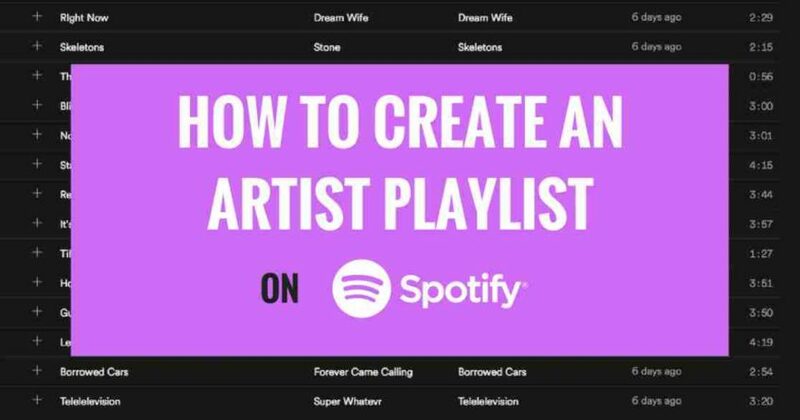 Particularly helpful for artists on Spotify, this guide discusses new features, questions, answers, tips & tricks and ideas for artist playlists and even how to get on a Spotify playlist. So search for music you like, or a track by artists in your collection, then add it to a playlist by mood or activity. Click New Playlist in the left navigation (Spotify desktop version). Give your playlist a name. It helps to have a name somebody might search for naturally. Give your playlist a description. You can use keywords in the first sentence to help your playlist come up in more searches. Choose or create an image for your playlist. This is highly recommended to make your playlist stand out. Save, and then find the playlist in Your Library. Add tracks to the playlist. Drag tracks into the name of the playlist on the left navigation, or right click a track and select Add to Playlist. Voila! The Spotify community offers additional tips and tricks for the various versions on mobile, desktop, Android, iPhone, or web player. Below is a YouTube video for how to create a playlist. Thanks to Chris Bumeter for this video. Go subscribe to his YouTube channel. If you are an artist, one important reason to create a Spotify playlist on your artist profile is because it can increase your chances of getting on official Spotify playlists. Spotify staff and their curators look at your artist profile to see if you are using the features they’ve provided on Spotify For Artists. Using them is a compliment to their staff and may endear them to your band. What is an Artist Playlist on Spotify? Artist Playlists are playlists only artists can create and they can only be hosted on verified artist pages. They are sort of hard to find. Scroll down to the very bottom of an artist profile. You’ll find they are either the last thing listed or the second to last, above “Appears On”. After getting Spotify followers or having fans save your music to their collection, creating an artist playlist is the next most important thing. First of all they’re fun to do, and Spotify wants you to do them. Furthermore your artist playlist becomes an asset for you. This is your chance to become a curator. Also, it gives you another piece of real estate on Spotify that you have full control over. Who knows? Other artists might be hitting you up to pitch their track for your playlist. Using the desktop version of Spotify, create your Artist playlist on the same account (with the same login credentials) as your verified Artist Profile. After creating the playlist, click the “ ⠂⠂⠂” circle button and choose “share”. Then, click “copy playlist link” to save this link to your clipboard. While logged into Spotify For Artists, click Profile on the left navigation. Under Artist Playlists, click the box with the “ + “ to choose the playlist you created above on your account. You can type the name, but I recommend the next step as a better option. RECOMMENDED – Paste the Playlist link into the search bar. (right click – paste), and it will locate your playlist. Click to choose it. Finally, hit Save, and you’re done. It’s now published to your Artist Profile. There is potential that your playlist will organically grow to tens of thousands of followers. Increase your chances and run your playlist the same way official Spotify curators run theirs. So you should go back to this playlist time and time again to add new tracks and share with your audience. Furthermore, every time you add new tracks and let fans know, it’s a chance to organically capture new fans. Just like your tracks are subject to Spotify’s algorithm, so are your playlists. Nobody outside of Spotify knows for sure how the algorithm works, and it changes frequently. But from experimenting, I’ve learned that there are some things to help your playlist show up in search results. Therefore this is a great way to get extra followers and plays on your playlist. 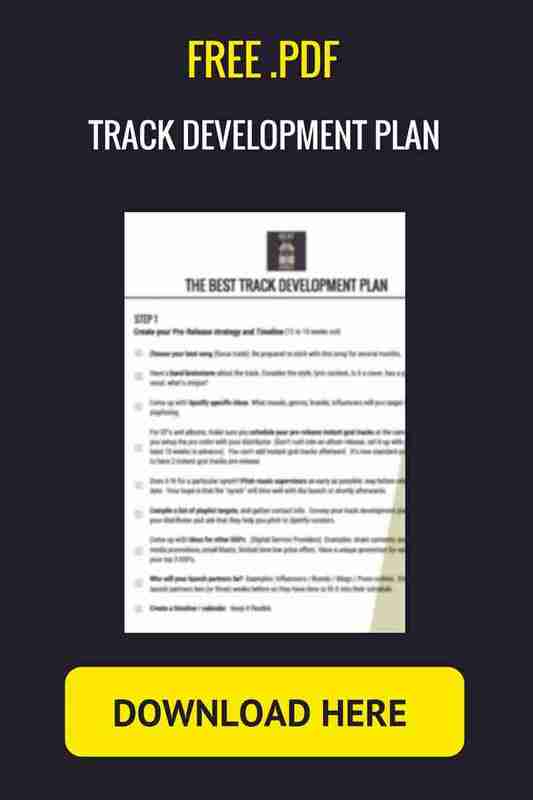 GRAB MY SPOTIFY TRACK DEVELOPMENT PLAN TO USE THE EXACT PLAN THAT I USE FOR INCREASING STREAMS AND SALES. 3. What makes a good Artist Playlist? MOOD – If you are not searching for music on Spotify by artist name or song title, you are most likely searching by mood. So you want the right music for the right occasion. Here are some examples. Consequently, terms like sad, happy, party, and depressed are pretty overused. Therefore there is a lot of competition. But don’t let that stop you. The algorithm changes constantly, and as a result you may get a nice jumpstart when your playlist is new. It seems like the algorithm favors “new” playlists. NAME IS IMPORTANT – I’ve noticed the Spotify search bar looks for keywords in your playlist name. So put the keywords in the beginning. They are less effective at the end of the playlist title. This is called “front loading”. If you have something in your title that gets a lot of searches, you may come up higher in the search results and get automatic traffic to your playlist from the search engine. DURATION – 30 songs minimum. Two or three hours is a good playtime, or around 30 to 70 tracks. Model yours after official Spotify playlists. FRESHNESS – As mentioned above, the algorithm favors “new” or refreshed playlists. Therefore you should be adding new tracks to the top of your playlists weekly, Conversely it helps to take some off each week to ensure freshness. But always keep at least 30 to 70 tracks in the playlist. PLAYABILITY – Make sure the playlist has flow from track to track. So unless the mood calls for it, you should probably avoid really long songs or songs that take forever to get to a hook. Finally, the algorithm keeps track of how many people skip tracks and tune out of the playlist. Description & Artwork – These days it’s easy to come up with cover art. Add original cover art using the Spotify playlist builder. Give the playlist a proper description that will describe the theme or inspiration behind creating it. The pro tip here is to use those highly searched keywords at the very beginning of your description. This will help your playlist show up in search results. Commentary Tracks – These are great for Artist Playlists, and only available to artists, not standard Spotify users. Basically it’s a :15 to :45 second voice track that you place as the first track in a playlist or between tracks. They take time to setup, but the extra effort will impress your audience and strengthen your brand. In a quiet setting record yourself welcoming fans to the playlist, describing it, and the inspiration behind it. Most of all, tell listeners to hit the “Follow” button. After you record it, you need to inquire with your distributor on how to set this track up as a “commentary track” – not a regular audio track like your music. They will help you through this manual process. Consequently, it takes a week or two to complete, but I think it’s well worth it. As a side note, this is an integral part of Pandora’s AMP (Artist Marketing Platform) program. I’ve used this strategy below over the past couple years and it puts everything that we’ve discussed so far into action. Stay focused on promoting your main playlist and have the others there to grow organically through the algorithm. I recommend building at least 2 or 3 playlists. Too many will probably clutter up your public playlist profile and water down the others. Listed below are three basic kinds of playlists. But ONLY FOCUS ON PROMOTING ONE. Change the name, theme, and artwork every month or so. Add and delete tracks every week. Post about the playlist frequently. Advertise it and include it in your email blasts. In addition, you can also use follow gates to get more followers. This is the one that you will drive your fans to week in and week out, and it’s your main playlist to promote. Concentrate on getting all of your followers onto this one playlist. Also you can rename it as many times as you want and you won’t lose followers. So you can repurpose it with a different theme each month. Only put a few of YOUR tracks in here. It should mostly be OTHER artists’ tracks. This one is your choice. It’s a chance to play and get creative. You won’t promote this playlist either. It’s just for your fans to discover after they have browsed all of your music and your main focus playlist. It can be a collaborative playlist between you and your fans. Check out this cool collaborative playlist idea on Facebook Messenger that Spotify recommends. Finally, other ideas include tour playlists, festival playlists, band member playlists, or any special theme or occasion. I mentioned above that on your main focus playlist you should change the name and theme every so often. However, if you strike on a playlist theme that goes viral – meaning you start to see an organic lift of hundreds of new followers a week – you’ve struck Spotify gold. Do not change the name of the playlist. Keep it the same name & theme. Just update tracks and add your own into this very powerful playlist. There isn’t a great need to continue doing monthly themed playlists, unless you enjoy it and want to keep going. If you want to continue, start another playlist from scratch and rinse and repeat the process on a new playlist. Another good tip is to reach out to other artists that you add on your playlist, and see if they will reciprocate. Use each others fans to help build playlist followers for your respective artist playlists. If you’ve noticed, nothing comes easy on Spotify. Short of messaging your fans a direct link to listen to the music, everything else requires know-how and a constant effort. Therefore, here are some common challenges with Spotify playlists for artists and some tips on overcoming them. Scroll down to the very bottom of an artist profile. The Artist Playlists are either the last thing listed or the second to last, above “Appears On”. Despite them being buried in the interface, Spotify places a lot of importance on them. Quick Tip: Use the Artist Pick feature to promote your Artist Playlist. You can find this feature within Spotify For Artists. Nothing worth doing comes easy, but I sure wish Spotify would make it easier for artists to grow their followers. Spotify users are still not very accustomed to following, saving, and sharing music on the platform. Compared to getting social media followers, it’s difficult to get Spotify followers and playlist followers. For tips on this see my article How To Get Followers on Spotify My Way. Quick Tip: Another tip is that social media algorithms suppress “follow” call to actions. To overcome this use follow gates and widgets to make it easy for your fans to follow you from one easy interface. Some companies that offer these are FeatureFM, Metablocks, and Show.co. Quick Tip: Utilize Spotify Song Codes. They work like QR codes and are built into the mobile app. You can place these codes everywhere online and physically print them on flyers, business card size handouts, and even on merchandise items. Spotify has been outpacing every other music streaming service and is on the verge of becoming a publicly traded company. As a result, they have over 80 million paying subscribers and many more on their free ad-supported tier. Music curation has now been extended to the fans and artists, and is no longer exclusive to the gatekeeper. Whether you want to know how to create a playlist on Spotify, get on a Spotify playlist, or learn tips and tricks for artist playlists, I hope you found it here. Finally, keep the conversation going in the comments. What questions or thoughts do you have on this subject?